Have you ever felt like you are the only person who loves a particular movie, or indeed has even seen it? Yeah, me too. There are some films which you watch, adore and then wonder why no-one else is talking about them. Somehow, they slipped through the net and swam away unnoticed, barely causing a ripple in the water. Some receive critical applause and yet make no money at the box office, some receive neither critical applause or commercial return at all, and some simply don’t enter the annals of their genres with the amount of respect and recognition that you feel they deserved. Here are the five movies which I feel deserved a far bigger fanfare than they were accorded. My overlooked gems. Feel free to add your own. 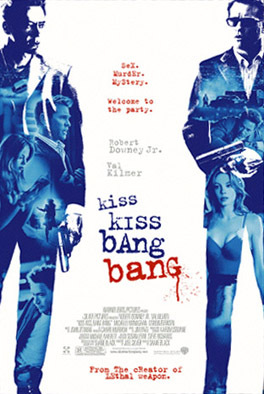 Having written some of the sharpest and wittiest action movies of the last twenty-five years (Lethal Weapon, The Last Boy Scout, The Long Kiss Goodnight), Shane Black finally got the director’s chair with Kiss, Kiss, Bang, Bang. Robert Downey Jr. and Val Kilmer share a great comic chemistry as a petty thief mistaken for an actor and a gay Private Investigator, caught up together in the intrigues of a seedy Hollywood. The plot is a tightly woven web of insane circumstances, paying an almost sarcastic homage to classic Noir, right down to Downey Jr.’s self-aware narration and love of crime novels featuring a detective with the inspired name of Johnny Gossamer. Val Kilmer has never been funnier, Downey Jr. is at his world-weary best and Black’s dialogue is of the sparkling standard that Tarantino has wet dreams about. And as far as I can tell, no-one saw it. Little known writer/director Lucky McKee should have made his name with this psychological horror, his second movie. However, even more deserving of wider recognition was lead actress Angela Bettis. May, a lonely young woman traumatised by an isolated childhood and minor disfigurement, is desperate to connect with someone, anyone, but lacks the social skills necessary to do so. May is a misfit in the deepest sense of the word, unable to exercise the normal modes of interaction which bring the world closer. As she tries, and fails, to develop relationships with those around her she gradually unravels to heartbreaking and horrifying effect. This is the kind of movie that hinges on a single performance and Bettis is phenomenal. Whether May’s actions are clumsy, vindictive or ultimately deadly, Bettis never allows our sympathies to drift away. That she did not break out into greater success on the back of this performance is a tragedy. 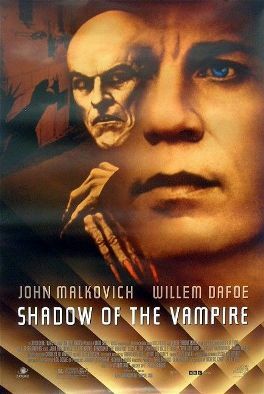 There are probably as many vampire films as there are Westerns, so popular is the genre, but ask anyone to name their favourite vampire flick and it’s unlikely that Shadow of the Vampire will be among many lists. That’s too bad because it gave a tired genre just what it needed; something a little different. Shadow of the Vampire is based on the actual production of Nosferatu, F.W. Murnau’s 1922 adaptation of Dracula, with one fictional element; Max Shreck, the actor who portrayed Count Orlock, is a vampire in real life and director Murnau is the only member of the crew who knows it. Willem Dafoe has a ball as the bald, rat-like Shreck and John Malkovich is at his lunatic best as the tyrannical filmmaker, allowing the vampire to consume expendable crew members, and promising him the leading lady at the end of filming in return for his co-operation. You are left in no doubt as to who the real monster is. Taking a break from producing big, dumb summer blockbusters, Jerry Bruckheimer got behind this true story of the Irish journalist murdered by drug dealers in 1996. 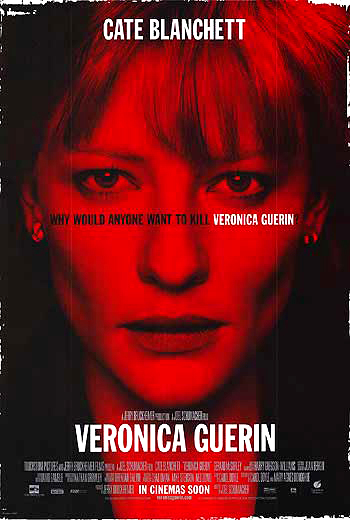 Slated in some quarters on its release, and ultimately recouping just over half its budget, Veronica Guerin is still a deeply affecting piece of cinema. Cate Blanchett, in the titular role, and director Joel Schumacher, wisely avoid going the route of presenting Guerin as a two-dimensional ‘plucky’ heroine. Instead we see a whole person; an obstinate, driven, but morally laudable woman who pursues the truth even when it threatens her and her family’s safety. And yet, thanks to Blanchett’s usual great work, she remains noble, admirable and completely sympathetic. The performances from all concerned are first class, and it’s a credit to Schumacher that the final, tragic resolution loses none of its impact, despite the foreknowledge. Coming off the success and acclaim of L.A. 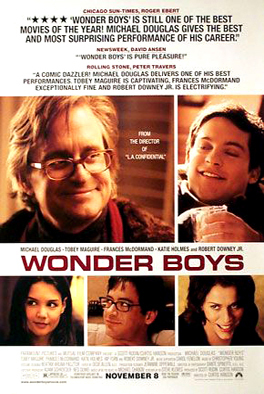 Confidential, journeyman director Curtis Hanson’s next project was a fantastic adaptation of Michael Chabon’s novel Wonder Boys. Charting one weekend in the complicated life of English Professor and novelist Grady Tripp, Hanson’s movie boasts a mouth-watering cast. Michael Douglas gives a career best performance as the pot smoking, crumpled writer, circumnavigating a multitude of woes in the midst of his faculty’s annual Wordfest convention. Tripp is juggling the exodus of his wife, the arrival of his editor (Robert Downey Jr.) who is keen to view the manuscript which Tripp cannot finish, the news that his girlfriend (Frances McDormand) is pregnant, the amorous attentions of one of his students (Katie Holmes) and the clingy depression of another (Tobey Maguire). Douglas is charming, witty and a lot of fun to be with, and so is Wonder Boys. A mystery, then, that the movie only managed a worldwide gross of two thirds its production budget. This entry was posted in Top Lists and tagged Angela Bettis, Cate Blanchett, Count Orlock, Curtis Hanson, Dracula, F.W. Murnau, Frances McDormand, Jerry Bruckheimer, Joel Schumacher, John Malkovich, Katie Holmes, Kiss Kiss Bang Bang, LA Confidential, Lethal Weapon, Lucky McKee, Max Shreck, May, Michael Chabon, Michael Douglas, Nosferatu, Robert Downey Jr, Shadow of the Vampire, Shane Black, The Last Boy Scout, The Long Kiss Goodnight, Tobey Maguire, Val Kilmer, Veronica Guerin, Willem Dafoe, Wonder Boys on August 4, 2010 by CZombie.